This year's American Presidential race is largely about jobs, or the lack thereof. Of course each party blames the other for the mess, but according to the new film DEATH BY CHINA, the real reason stems from a rare case of bipartisan cooperation. Thanks to the joint efforts of Democratic president Bill Clinton and a Republican controlled congress, in 2001 China gained membership in the World Trade Organizatin for China, paving the way for U.S companies to engage in free trade with the Communist nation. It was supposed to open up new markets for American companies, and over time, help the Communist Chinese realize the error of their ways on human rights issues. Not quite. Since 2001, 57,000 American factories have closed and millions of American jobs have been lost as multinational corporations moved their manufacturing operations to China. As for China's human rights record in the past decade, ask Chen Guangcheng or Ai Wei Wei. Of course U.S. trade policy with China isn't the only cause of our current financial woes, and even if China wasn't selling us a single microwave or big screen TV it's doubtful they'd be a haven for free expression by now. Still, as DEATH BY CHINA documents, our trade policy plays a huge role on both these issues, and it's far from the rosy “win/win” scenario we were sold. Narrated by Martin Sheen, DEATH BY CHINA sets out to explain why “free trade with China” is really an oxymoron. Thanks to currency manipulation, lack of environmental regulations, lack of workplace safety rules, and even the use of slave and child labor, the economic playing field is anything but even. China also has a documented history of stealing the technology and intellectual property of companies that relocate there. After a few years, the multinationals who were so keen to move their plants to China suddenly find themselves competing against Chinese companies making the same products, or in some cases having their factories completely taken over. Not only is this bad for the economy, it's bad for defense. According to the film, the U.S. can't make a single military plane without using Chinese parts. Finally, there's also the health and safety concerns with Chinese products. Remember the pet food and toy recalls in 2007? Obviously one wants to use caution when viewing political documentaries like this one. Film has considerable power to manipulate the emotions, and unlike a book, it can be more difficult to check the veracity of sources – movies don't generally have footnotes or bibliographies. Still, there's a fairly respectable parade of talking heads from both left and right, and not just from the political sphere, who all seem to agree this is a major problem. They also all seem to agree on the solution: we need to reform our trade policy with China. 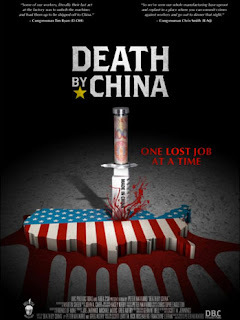 DEATH BY CHINA was written and directed by economics professor Peter Navarro, adapted from his book of the same name. While I wouldn't tell him to quit his day job just yet, he does a competent job of translating his thesis to the film medium. Nothing fancy or special, mind you; just a bunch of people talking into a static camera and a few animations. And unlike far too many political documentaries, Navarro doesn't feel the need to try and turn his film into a snarky comedy just to hold the attention of his audience. Navarro has faith that what his film has to say is compelling and important enough in its own right. It is. 3 1/2 out of 4 stars.